This wine is 100% Pinot Noir sourced from Gap’s Crown Vineyard. Gap’s Crown is one of the Sonoma Coast’s great vineyards, first planted to Pinot Noir and Chardonnay in 2002. Located in the foothills of the Sonoma Mountain, above the Petaluma Gap, it offers a variety of soil types at elevations ranging from 300 to 800. The prized section Patz & Hall works with is on the flank of the mountain, and is the second highest block on the vineyard. It features Goulding series soils, with some heavier clay interspersed with volcanic rock and lots of gravel. These soils are extremely well drained, and coupled with the site’s wind and fog, help to ensure low yields. 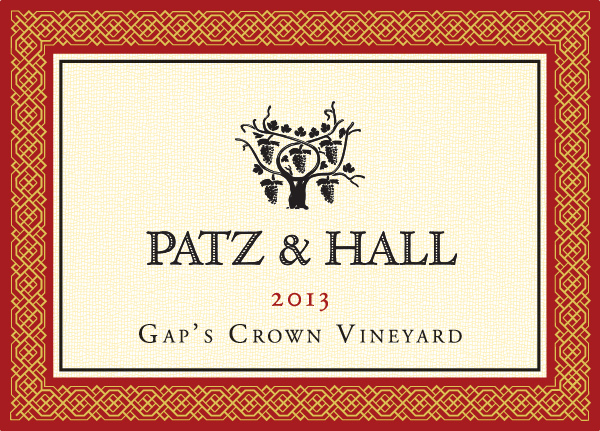 Gap’s Crown is one of the last vineyards Patz & Hall harvests each vintage. This wine undergoes a multi-yeast fermentation (wild and cultured) with about 15% whole clusters. The wine then undergoes full malo-lactic fermentation in Burgundian French oak barrels (65% new). Bottled without fining or filtration.